I want to talk about tempo, what that means, how you can fix your rushing the downswing, and why that’s causing you problems. When we’re talking about rushing the downswing, or tempo and sequence here, I see that pop up most often with golfers specifically from the top of the backswing to the downswing portion. There are a lot of great golfers who swing at different tempos. 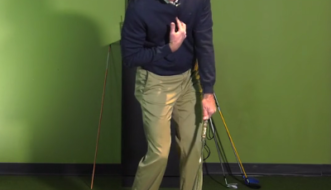 This video is not meant to say that you need to swing very slow, or very fast, or somewhere in the middle. I see people play their best golf sort of swinging and playing at a tempo that they naturally use. For instance, I’m a bit more of a faster talker, and a fast-paced person in general. I would swing with a quicker tempo. Someone who’s more sort of la-di-da-di might swing a little bit longer and slower. Like a Freddy Couples is a good example of a guy who’s sort of more relaxed, hanging out, and he’s sort of a long, slow tempo, versus, say, a Nick Price who might be really short and quick, and just walks and talks faster, like a Lee Trevino type of player. 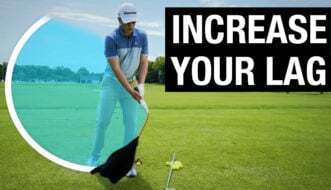 So, I would say, go with what your normal everyday motion is, but within that quick or slow tempo, there’s still acceleration, there’s still, what’s the timing from the top of the backswing to impact. 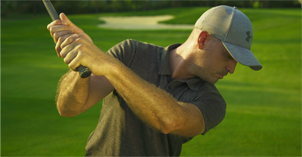 And, by far, the biggest issue that I run into is, when you get up to the top of the backswing, a lot of you guys and gals are wanting to rush your arms and hands down in front of you, most specifically. Very rarely do I run into problems where someone’s body moves too fast. In fact, I can’t remember the last time that I was working with someone and I said, “Hey, man, hang on a minute. Your body’s opening too quick,” or, “You’re rotating too much.” Well, no. 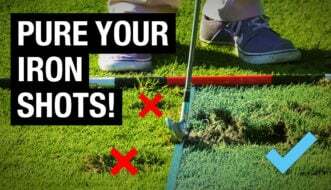 That would put you in line with the best golfers in the world who rotate their body the fastest. The issue, more so, is trying to get the arms and hands down. The tension that you have, really gripping the club tight, and trying to pull the club down in front of you would be a bad recipe for like 99.9% of you golfers here. Watch the video to see my advice.